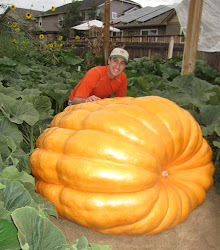 Giant Pumpkin Growing Tips From The Pumpkin Man: The Pumpkin Season has Begun (Kind of)! The Pumpkin Season has Begun (Kind of)! This time of year for years I've done the same thing. As the weather starting warming up and you start seeing some of the crocus and daffodils peaking through the ground, my pumpkin growing fever starts to rise. To curb the cravings I like to start something off that can be productive. 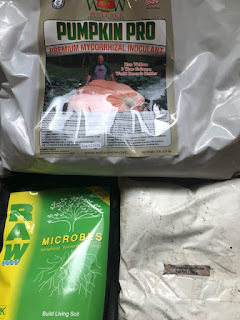 I've talked on this blog a couple of times about getting myco going in pots before you start your actual seeds. I won't be start my plants for a couple of weeks, but it takes a while for myco to become mature enough that it is actually providing some benefits to the plant, so it is good to start it now. At the Niagara seminar Neil Anderson of RTI, whose company makes more myco than probably any other company out there, stated (somewhat quietly), that it may take a couple of months for the myco to get to the point that it is bringing back nutrients and water back to the plant. I stuck around after his seminar and asked some additional questions about that. He suggested during the seminar that "pre-starting" some myco before you started the seeds and then transferring that seed starting mix to the pots may be a good idea. Typically I would have started some seeds a week ago, but I only got these started two days ago, because life has been very busy lately. 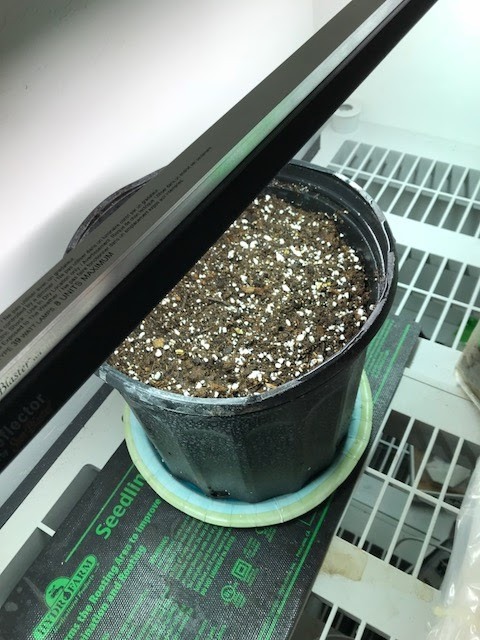 Using the paper towel method I started two 747 Johnson seeds. Those sprouted and I then put them both into one pot with two different brands of myco, Azos and some other beneficial bacteria. I also put a pinch of a WOW Super Start Pack in the seed starting mix. The day or day before I start my actual seeds I plan to grow this season, I'm pull the plants from this pot and mix the soil in the seed starting mix of my other pots, so each pot will get some of this more mature myco. I'll still put some additional myco and microbes in the pots of the plants I'll actually be growing this season. The other benefit of doing this is that it forces me to get my stuff pulled together in advance of when I start my actual plants and gives me a little practice. For example, in the pot I put the seeds in today, I should have put a little humic acid into. Hopefully this will help me remember when it becomes more important. In about 3 days I suspect I'll start seeing the plants popping through the soil. I start two plants in the soil to get more roots going throughout the pot quickly. I figure more roots means more myco getting fed.